The focus of Tuesdays Channel 4 News programme was on the potential impact of a Brexit on Poland and Polish migrants in the UK. The key point of note was the degree to which Poland has benefited from membership of the European Union with countless examples of near wholly funded by EU infrastructure projects right across Poland that have literally turned desolate regions into modern landscapes populated by new airports, roads, bridges, parks and cultural attraction centres that the EU excels at funding so as to put its blue flag stamp all over the regions. Another item that illustrated the magnitude of Polish migration to Britain is the fact that 75% of the passenger traffic from the airport mentioned (Lublin) was to Britain! And then there was the Polish view of the NHS, which was basically to say that it was rubbish in comparison to the Polish health service due to difficulties in getting GP appointments and the long hospital waiting lists. Which would come across as highly ironic to many British viewers, as the primary reason why the NHS is in a state of crisis is due to the fact that Polish amongst other eastern european migrants have over the past decade literally uncontrollably flooded into Britain bringing the NHS, schooling and housing amongst all services to crisis levels. It is simple, dump 8.2 million people into Britain and yes it will push services such as the NHS to breaking point. Whilst Poland has seen 10 million Poles migrate westwards resulting in Poland's population falling from 50 million to 40 million, so YES as 1/5th of Poland's population has migrated westwards then there will be plenty of capacity for Poland's health service, cheap housing and easy access to school places. Another example had a Polish worker in receipt of high UK wages now working over the internet from Poland, shown to be in the middle of building his dream home in Poland for just £60k which would buy very little in the UK. This illustrates the propaganda of migrant workers contributing more than they take as being FALSE, as migrant Polish workers are earning UK wages not to spend or invest here in the UK so as to generate economic activity, but withdrawing the capital and spending and investing it back in Poland. So Britain loses doubly, once through a well paid UK Job being taken by a migrant worker and then again due to loss of capital that acts as a continuous drain on the British economy which when everything is taken into account costs Britain an annual £75 billion! Far beyond the net £10 billion annual EU contribution towards building cultural centres, roads, bridges and airports in Poland. The news story ends with several Poles stating that they were very worried about a Brexit outcome as that risked ending Poland's gravy train quoting the programme "When it comes to attitudes towards the EU cake, people here in Lublin are to coin a phrase are very much pro having it and pro eating it", and even risks unraveling the whole EU project, and what is true for Poland is true for the WHOLE of eastern europe! You should be able to watch Tuesdays programme on Channel 4's Youtube channel soon. 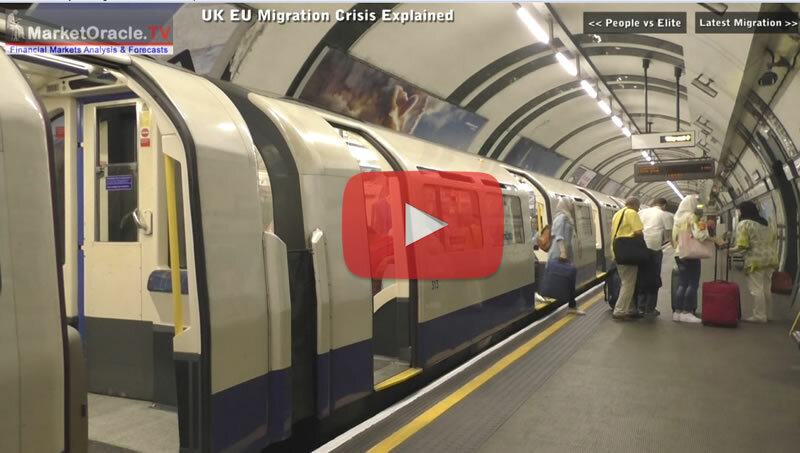 The bottom line is that EU migration is both out of control and does NOT benefit the ordinary people of Britain, only the elite who prosper from tax payer subsided low wage migrant workers (tax credits + housing benefit), on the contrary out of control EU migration IS the primary cause for the crisis in UK housing, schooling and healthcare that many Polish people smugly criticise as not being as good as the health service back in Poland!